After a surprisingly clear victory of the C-Type in 1951 and a disastrous failure of the team a year later, the extensive preparations for 1953 Le Mans were meticulously executed. The Jaguar Cars Ltd. sent a total of four vehicles to France. The work invested paid off: game, set and victory. On June 14, 1953 at 4 o clock the Jaguar boys were at the finish – all raced C-types crossed the finish line, the win, second, fourth and ninth place was theirs. The long-distance classic was from the beginning onwards the main target for Jaguar, they were aware of the marketing effect of a success in Le Mans. 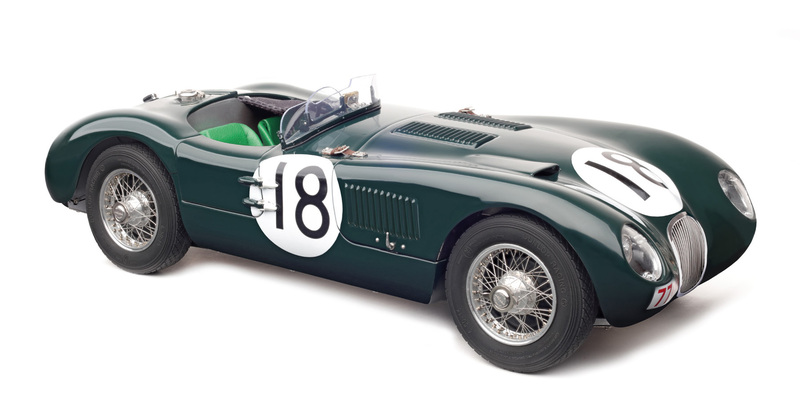 Accordingly, Jaguar’s emphasis in the development of the C-Type on high reliability and good handling characteristics. Jaguar set the balance of aerodynamics to high end speeds. Chief engineer Bill Heynes did a great job there. The chassis was redeveloped as a tubular frame. Above that frame Jaguar skinned a thin aluminum body with only one driver´s door. Designed by the gifted engineer Malcolm Sayer, who designed warplanes a few years earlier for the English Royal Airforce. The cockpit was protected only by a small racing screen. The space conditions therein can only be described as narrow evoked by the struts of the space frame. But the Jaguar drivers found all necessary instruments in the cockpit of the C-Type and even spare spark plugs and tools for repairs during the race event. After the retirement of the whole factory team in 1952, four C-types were completely rebuilt for the upcoming season: The revised engines received three Weber twin carburetors type 40DCO3, the body was now made of very thin aluminum sheet, the rubber tank was a product from the aircraft development. Jaguar first used the newly developed Dunlop disc brakes and a servo amplifier for brake pressure assistance. For improved roadholding in Le Mans, the rear axle got an additional support and the front axle got a stronger anti-roll bar. The effort had paid off at the end of the race. The Jaguar boys also won and finished second, fourth and ninth. William Lyons dedicated this triumphal march to the recently enthroned Queen Elisabeth. Her Majesty returned the favor in her own way and knighted the Jaguar chief in the spring of 1956.